In this excerpt from 'SFS Pentatonics 2 - Navigating Chord Changes', we talk about the concept of voice-leading, and how we can practice it to gain the freedom to improvise through key changes without interrupting our flow. "Up to now we have covered soloing over chord changes and locating our root notes horizontally. Now it’s time to get our feet wet on what is known as “Voice-Leading”. This term, “Voice-Leading”, comes from classical harmony, and is also used in modern arranging, to describe how a composer or an arranger chooses to have each voice in a choir, or an instrumental ensemble, move from one chord to the next. Usually what they are after is to have each voice move smoothly to a note of the next chord that is close to it, so that the whole flow of the multi-voice arrangement sounds smooth and connected. Now you may be wondering what that has to do with improvisation on the guitar. Well, improvisers have taken this term “Voice-Leading” and use it not only for harmonic motion, but for melodic playing as well. 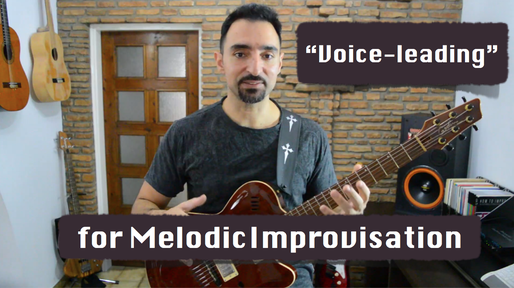 When we talk about voice-leading in improvisation we refer to improvised lines that are weaved smoothly and naturally through a progression of chords, without stopping our phrases for every new scale. So phrasing becomes free and independent of what’s going on harmonically. In other words, chord changes do not dictate where you begin or end your phrases, or what direction you take, or what ideas you choose to employ. This voice-leading effect of going through the chord changes without spoiling your phrasing freedom, is a trademark of great improvisers, especially in styles such as jazz, bebop, fusion, gypsy jazz, country, bluegrass, but you hear good players do it in more mainstream styles such as rock and pop as well. And just like I mentioned before, jumping in parallel from one scale to the next is usable, and can also serve for some nice special effects, but it’s not the norm for smooth voice-leading, because these position changes make it difficult and sometimes impossible to continue your melodies smoothly through the scale change. So we need to learn how to quickly locate the new scale in the area of the fretboard where we are already playing, and visualize it so that we can transition to it smoothly. At the highest levels this can be a very complex skill, involving knowing the degrees of every chord scale, what notes they are and how they sound and so on, but we can use the effectiveness of SFS to dip into this straight away, and start using a basic level of this beautiful sounding technique immediately. When you master what I will show you in the following lessons, you will be head and shoulders above the majority of guitar players in terms of improvisation skills, because most players have a lot of trouble doing this. So let’s begin with our first step. Take a look at the diagram above. What I did here is to separate the natural root notes on the fretboard into 5 different vertical areas so that we can have an organized way of practicing them. 5 different areas cover the whole fretboard. The 6th area on this diagram, the blue one on the right, is just an octave up from the first area, and if you want to go even higher on an electric guitar you will just need to transpose the second or 3rd area an octave up as well. Note that this is just an arbitrary organization. I made this up for the purpose of teaching this. You group notes differently if you want, as long as you have vertical areas that include all 7 natural notes. In fact, in the SFS Pentatonics Crash Course, I did a version of this exercise with a totally different set of notes. So what we will do here, is to choose a vertical fretboard area and use that for our root note choices instead of using a single string like we did before. For sharps and flats we will use the ones that are located around these natural notes. Watch the video to see examples of this. So your mission for this lesson is to practice minor, using 3 SF’s, in each one of these vertical fretboard areas. You should practice in 3 stages: First warmup with just the root notes, then play the scale like an exercise, and finally improvise, trying to maintain your flow through the changes by visualizing the next scale ahead of time. Of course it’s still early to expect this to work all the time, because the limited choices and the 3 SF’s will cause interruptions, but we will learn many things later that will make you even more free to voice-lead, like building the system backwards, or using alternative root notes, and so on. Just do the best you can here. Our goal is to gain comfort in locating root notes that are close by and quickly mapping our system. In the video I play you an example of all 3 stages, using the 3rd vertical area, and in the improvisation part I want you to notice that sometimes I choose to conform my phrasing to the chord changes, but some other times I choose to voice-lead through the chord changes and form my phrases independently, starting end ending whenever I want. Both are nice choices and true freedom is to be able to choose by inspiration and not by limitation. So have fun practicing this. Try to be creative, start simple and gradually introduce more ideas, maybe implement some improvisation tips from SFS Pentatonics 1, and when you are ready we will move on to lesson 6 where we will see how to do this for major". SFS is an amazing system for mastering all fingerings, all positions, in all keys for any type of scale, WITHOUT BOX SHAPE MEMORIZATION. Using understanding instead of mindless repetition, SFS allows you to learn how to freely navigate the fretboard in record time.